It is fascinating that every family has its own unique food culture. Each person’s preferences and quirks all come together to create this culinary superpersonality that resides in the kitchen. Our’s is named Charles. Like Charles from MASH, a show for which we have an odd obsession. Both of these Charles are fussy and arrogant. Charles is the presence that demands peanut butter in savory dishes. Only savory dishes. Not sweet ones. He definitely eschews the classic chocolate and peanut butter combination. Charles declares that no whole or chopped raw tomatoes are to be used. Tomatoes have to be pureed into a state that shows no sign that a whole tomato fruit with pulp and seeds and insides actually existed. Charles is squeamish around raw mushrooms, but not cooked ones. Charles will eat green apples raw, but never ever cooked, which means no apple pie. You get the picture. I personally had a recent craving for chocolate and peanut butter. But our friend Charles wouldn’t be into that. It occurred to me that tahini, a preferred ingredient of his, can sort of act like peanut butter. And though it may have started out as a compromise dessert, letting me curb my craving for chocolate and peanut butter without actually subjecting Seth, I mean “Charles,” to being in proximity to said combination, it became something more. The tahini lends a wonderfully subtle earthiness to the chocolate, while the roasted sesame seeds became fun little crispy surprises with each bite. It came into its own, satisfying everyone. Even Charles. In a large microwaveable bowl, whisk together the milk, chocolate, sugar, cocoa powder, and salt. Microwave gently in 20 second intervals, stirring between each one. Once the chocolate has melted completely, stir in cream, vanilla, and tahini. Chill. Place in ice cream maker and churn according to manufacturer’s directions. Stir in the sesame seeds when the ice cream is about 2/3 of the way churned. Finish churning, then eat! I'm loving the use of oriental flavors in your recent posts! !I absolutely love them myself and can imagine the delicious earthy flavors here :)Awesome!! What a extraordinary mix of flavors! Ice cream with sesame seeds and tahini is the first I have heard of....girl I think you have hit gold here....did you use an ice cream maker to do this? This ice cream sounds wonderful!! Love, love, Love tahini! Wow! what an amazing ice cream! We've been on such an ice cream kick, I can't wait to try this one! What a cool idea for a nutty choc recipe! I'm dying to take a taste! Looks absolutely delicious! I would so love to try some. I am sure it tastes amazing. This ice cream looks amazing. Looks so chocolatey and smooth! Love it. Looks interesting. I am not a real sesame fan, but if it is in ice cream it turns into a different story altogether. Time to get the ice cream maker churning. Looks delicious! What a great combination, I'd love to try some! I don't know if I could be with someone who didn't love the choc/PB combo. I just don't think we'd really GET each other. :P Chocolate and tahini sounds awesome also, though! Wow, what an interesting use of tahini! I love that subtle sesame flavor that it imparts and can see it being totally complementary to chocolate. I cook a lot of dishes with sesame seeds or sesame paste, yet I've never thought of use them with chocolate! I'm super intrigued!! LOVE IT! Haha this is a great post! I can't imagine a life without apple pie or chocolate & peanut butter. What a great way to replace the peanut butter with tahini! Love this idea, looks delicious! Yum! Charles has good taste (for the most part ;)) Next you need a sour apple substitute! I love these flavors! Most people don't think to use tahini in sweet recipes but it's so perfect. Creamy, rich and delicious. Fantastic! This ice cream is just irresistible. I love tahini and use it a lot on a daily basis. I used sesame seeds in some peach almond ice cream earlier this summer. How lovely to pair them with chocolate! What a great use for tahini -- I want to try this! Tahini is very popular in Greece but I have never tried it in ice cream. This is a brilliant idea! I have never heard of such an ice cream! Clearly, I'm missing out. You always have the most unique recipes. Oh my goodness, what an amazing sounding ice cream. So creative! I've never had tahini. But this ice cream looks so so soooo gooood! This ice cream sounds delicious! Love the flavor combination here! What a fantastic flavour combination! Makes me wonder why I never thought to pair buttery + chocolate...silly me! Looks great guys!! I would of never thought to match tahini with chocolate! It makes perfect sense and if "Charles" likes it I'm sure it was delicious! I have 2 Charles in my family. I've always loved MASH too, but Hawkeye was always my weak spot! How unusual! I'm a fierce lover of the chocolate/peanut butter combo, so if you said this sated your craving, I'd be willing to try it! Wow, this is really an interesting ingredient here using the tahini. Totally inspiring. No apple pie???? Wow...at least you have this awesome ice-cream! You blew my mind. This is wicked cool. we'd like to invite you to submit your food photos on a Food Photography site so our readers can enjoy your creations. This is such a creative combination. I love it! Poor Charles, not liking peanut butter and chocolate together. What a shame. This recipe is so intriguing! A must-try! I love the chocolate tahini combo. I made cookies using that combination and ice cream would be perfection. Oh wow, this is a very creative idea! I was thinking about making Asian Style ice-cream last night, and i thought about green tea / Black sesame .... but this recipe of yours is just fab!!!! really really good! Icecream with Sesame and Tahini? I never would have thought to put sesame in my chocolate ice cream, but i sure will from now on. 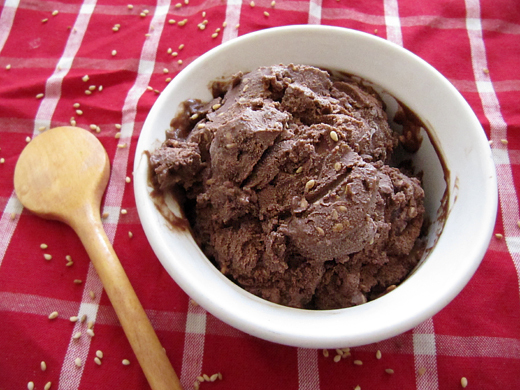 The nuttiness of the sesame is the perfect compliment to chocolate!